Last Saturday evening, everyone in the streets were looking up. 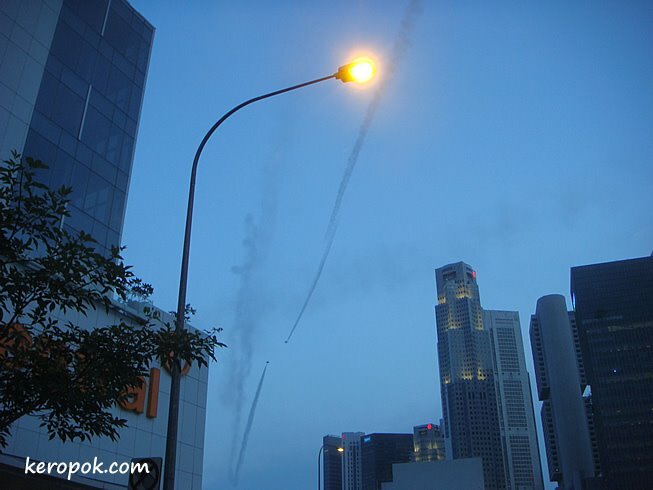 The thundering loud sounds of fighter jets were doing a demo for Singapore's National Day rehearsal. At certain angles, it was as if the fighter jets are going to collide. Did not manage to capture it as we were all so fascinated and all necks were looking up! oh no, keropok man shot down the jet with his camera!! A few years ago, I was in Paris on 13th July (our national feast is on 14th July in France), we saw the planes training above our heads, three or five in line with three-coloured smokes behind them, it was really impressive! impressionnant, on a l'impression qu'ils vont se rentrer dedans. impressive, one has the impression that they are going to go inside. Nice pic. I just seen now the Black Knights and other jet fighters whizzing past our tall building in Marina area at very close distance. Not to mentioned the noice roars as it approaching. "Scarecrow Garden" @ Hort Park - Who is this? Lidi Brooms - The wonder broom. The Singapore Flyer Cabin from a different angle. Changi Airport Terminal 1 - Guess my flight..